Like most people, I have always made New Year’s resolutions. In the days leading up to New Year’s Day, I start to think about what I will resolve to do over the next 12 months. 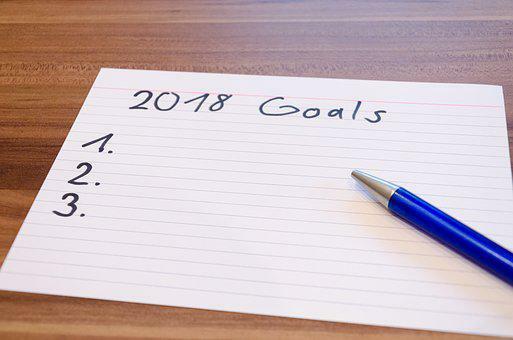 Without fail, every year, when I wish everyone I meet on 1 January a Happy New Year, I inevitably always follow up with “So what is your New Year’s resolutions?” Just as often I am asked for my New Year’s resolutions. None of these goals ever worked and I never achieved any of it. The longest I had ever kept to my resolution is 1 month. Why? Because to me, those goals weren’t all that important. Whether I lost 5kg or reached a certain weight or not didn’t really matter. I knew I wasn’t overweight. It didn’t matter if I went to the gym 3 times a week or not because I knew I was already fit and incorporate lots of movement in my days – I love walking all over my neighbourhood. As for the diet, it’s nice to eat more fruits and vegetables, but to me, that wasn’t all that important because I already have a well-balanced diet. I could do with more fruits and vegetables and fewer carbs, but if I didn’t it wouldn’t matter. Setting these goals were simply for the sake of goal-setting. High achievers all do the goal-setting thing, right? Everyone sets new year’s resolutions, right? And so I do. I set the goals and ‘resolve’ to achieve those goals, but in reality, I saw goal-setting as an inconvenience. It means I have to do those things to take me one step towards achieving the goal – but I didn’t want to be bound. I want the freedom to float around, to pursue interests as I see fit, to live my days carefree and embrace what comes next. There is nothing wrong with wanting that freedom – except I am not that type of person. I am a person who needs structure and plans and steps to follow … but only if it’s for the right reasons (according to me). So when a goal isn’t that important, the resolve to achieving those goals wanes over time. I am a driven person and results-orientated. If something is important enough, I will work on it to achieve the result. But I wasn’t committed to achieving my goals because those goals weren’t that important to me. The lack of real commitment to achieving a result means results aren’t achieved. Writing down goals that I know isn’t important and therefore not likely to motivate me to achieve it will basically mean I am setting up myself to fail at the outset. Worse, writing down these goals serves as a reminder that I am failing every day by not taking the necessary steps to achieving those goals. Every time I procrastinate, I dread the nagging feeling that I am continuing to fail at achieving my goals. I couldn’t be reminded of my failures if I didn’t write down my goals. There won’t be a reminder to get back to the program. I wouldn’t have to take a detour from what currently interests me to do what I ought to do to achieve my goals. I wouldn’t have to continue with my New Year’s resolutions to achieve those goals and there will be nothing to tell me that I’m slacking off. All this changed in 2017. I found my reason (or as is said in many motivational sessions – my WHY). In 2017 I finally decided to pursue my real interests, the things that excite me every day. In 2017 I decided I want to share the journey of how I am improving my children’s financial literacy with others. Sharing with others have also made me more mindful of the purpose of my conversations with the children. I had to become more intentional in teaching my children about money. Rather than having conversations on the fly and then forgetting about it, I now have to analyse the conversation. Why am I having this conversation with my children? What is it’s purpose? Where does it fit in? What do I hope to achieve from this conversation? Is this something other parents can also do? Why were these goals different to the others ones I’ve made previously? The first goal is about sharing my journey with other parents. This is very important for me because I have researched for years and read up on so much on how to teach young children about money. It took me a long time to analyse and reconcile all these differences to finally create a system that works for my family, based on first principles. Sharing my journey with other parents is my way of writing about these first principles. The second goal was a childhood dream. Writing this book fulfils my childhood dream of being published. Having my name as the author of a book makes me so happy. The topic of the book is a legacy. I wrote the book for my children – as a record of what I did to teach them about money when they were young. It is for them to take the book and implement as they see fit in the future. So these two goals were definitely very important for me. For the first time in many years, I wrote down my goals and New Year’s resolutions for 2017. I wrote them down because they were important to me – I wanted to achieve the goals. I wanted a daily reminder to continue to take one step towards achieving the goals. And you know what? All of the mantras are true. 2017 ended with 53 blog posts and I finished writing the book. The ebook version is available for purchase online (for a bit of shameless promotion, click here to buy) and the hardcopy version is due for release in early 2018. For the first time ever, I can actually remember my New Years resolutions from 12 months ago. In January 2018, I again wrote down my goals for the year. I again committed my New Year’s resolutions to achieving those goals. Will I achieve all of them? Maybe and maybe not. But you know the saying: aim for the stars, even if you don’t get there, you will still land on the moon (I had 5 goals written down in 2017 and I achieved 4 of them). One of my resolutions in 2018 is to engage more with my readers. Sharing the results of my ideas is one aspect of Kids Money Habits. Taking you along with me on my journey is another aspect I want to do more of. I don’t want to just blog every now and then about what I have done with my kids. I want to engage more with you, to issue challenges for you to undertake, give you ideas to test out for yourself, test out ideas alongside you and share results together, as it happens. Is this going to be difficult? Absolutely. I am not taking a step out of my comfort zone here. I am actually leaping out of my comfort zone. For me, 2018 will be a year of trying new things outside my comfort zone. I am not sure what I will do to increase this engagement, but one thing is for sure – I’ll be trying new things. If you have any ideas of what you would like to do, I’d love to hear from you.